We had to get up early today as Big Foot needed the group to meet at their office by 7:30am. The hotel left out some breakfast and coffee in a flask, as it was too early for the normal breakfast time. We parked the Weasel in Big Foot's locked backyard and waited for the rest of the group. It's worth mentioning that if you do the two day trip that we were doing, you don't need to pack everything into the dry bags as we had thought. 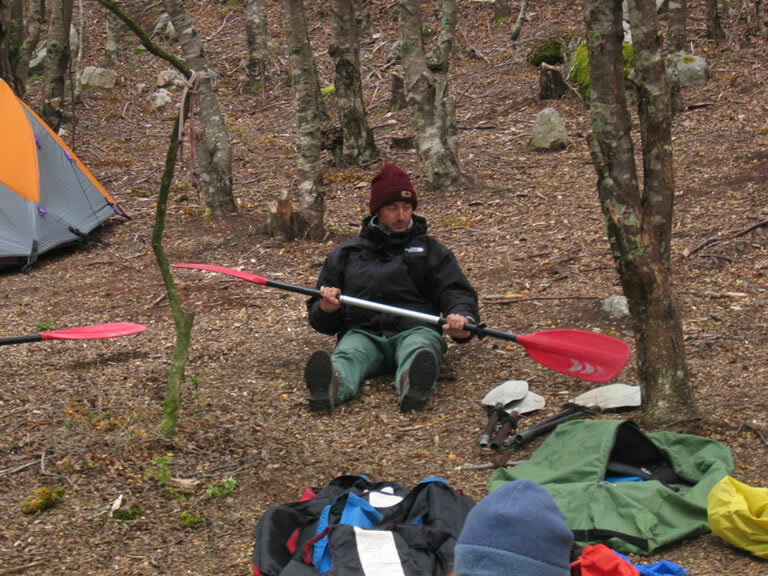 You can take a rucksack/soft bag for your stuff, and then fill the dry bag with the things you need in the kayak (camera etc), leaving the rest of your things in the tent at our destination. If we had known, we would have brought a few more warm clothes as it gets pretty chilly in the evening. Big Foot supply the sea kayaks, all paddling gear (paddling jacket, lifejacket, pogies, etc), food, tents, kit mats, and cooking equipment. All you need to bring is a camera, sleeping bag, change of clothing for paddling and lots of stuff to keep you warm in camp. The trip we did was the "Serrano Glacier Kayaking Adventure", and it cost a whopping $250 each. Expensive for just two days, but it was really good fun. We piled into Big Foot's 4x4s and made our way over to Puerto Natales' main pier. 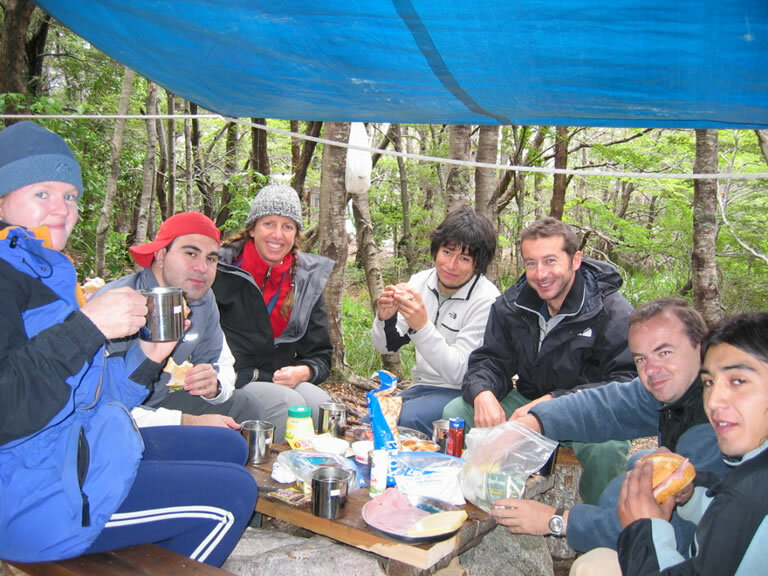 Here we joined the "21 de Mayo" vessel which would take us out to the Parque Nacional Bernardo O'Higgins. Our group wasn't alone on the boat. It was jam packed with tourists on a circular day trip. Initially we were all sat together in a private cabin on the top deck, but we got thrown out by another group as it had been double booked and their group was bigger. Making our way down to the lower deck we couldn't all sit together as there were few seats left, but we spent a lot of time out on the deck anyway, taking in the views. 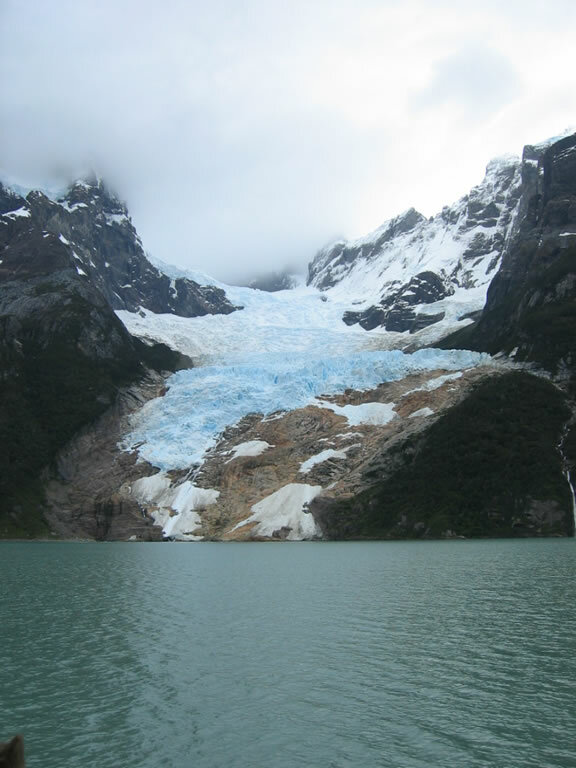 The boat ride to the Serrano Glacier, where we would camp that night, took about 4 hours. A leaflet was handed out to let you know all the interesting things to see on the way, including various Estancias, a cormorant and sea lion colony, "Condor Cliff" (although we only got to see a baby condor), and finally Glacier and Monte Balmaceda. Four hours later we arrived at the Serrano Glacier. 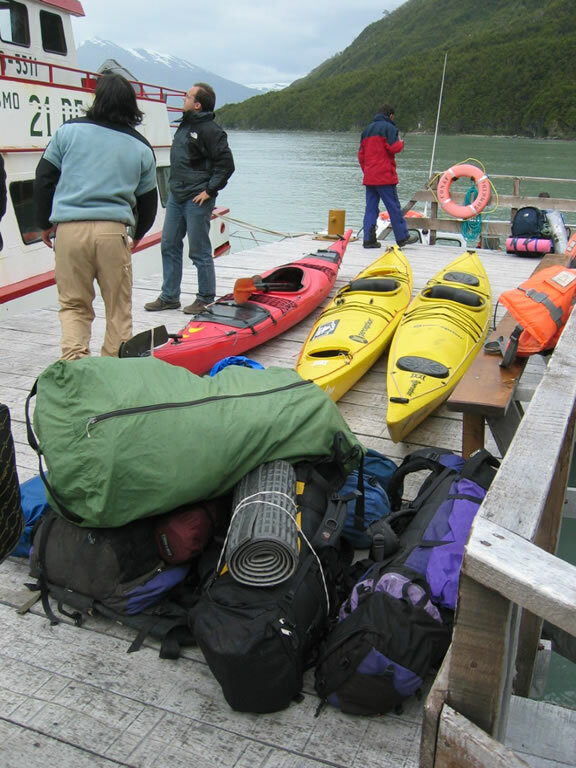 Whilst all the other passengers left the boat to walk to the glacier, we unloaded our kayaks, equipment and food and headed into the beech forest and our camp. 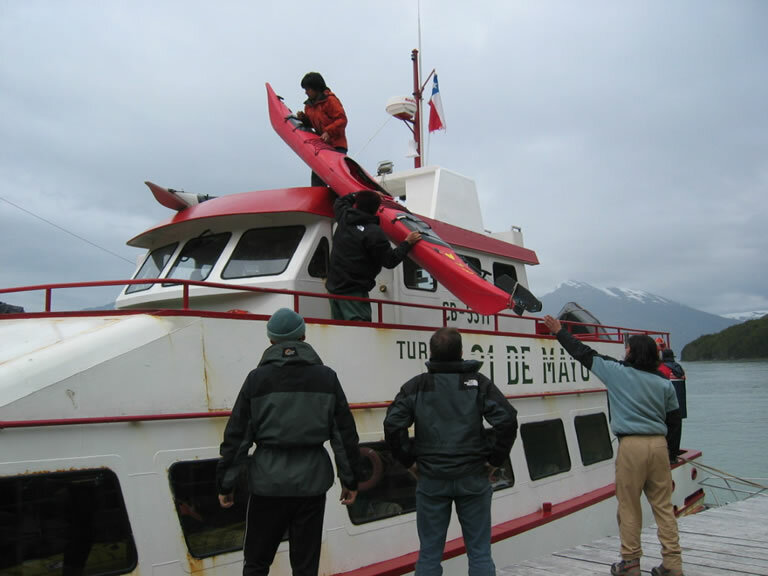 The guides set up for lunch and we dumped our bags in our tents and went off to look at the Glacier and ice floes in the Serrano lagoon (by this time all the passengers from the boat had returned to the boat and we had the place to ourselves). After a lunch of soup, cheese, bread etc, we got ready for our first bit of kayaking. 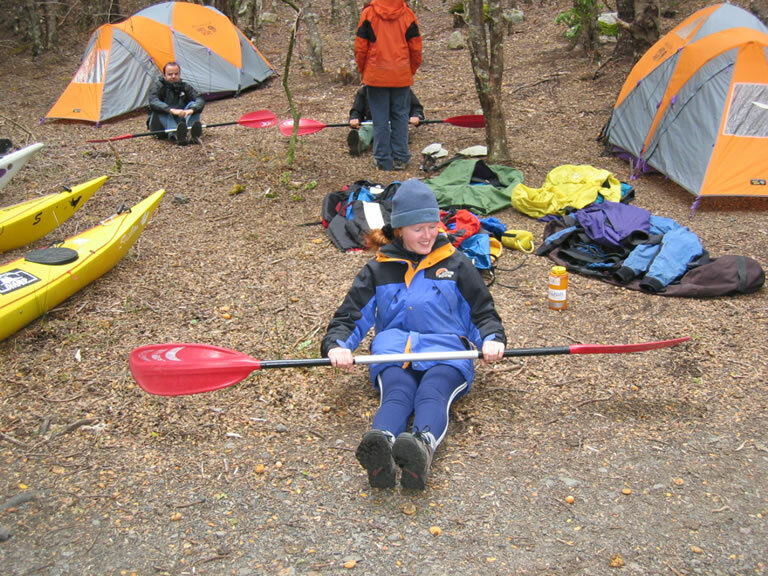 As not everyone had kayaked before, we were given some initial instruction and had to demonstrate paddles strokes etc, seated on the ground. An odd sight for an observer! We were then ready to go out onto the Serrano River.